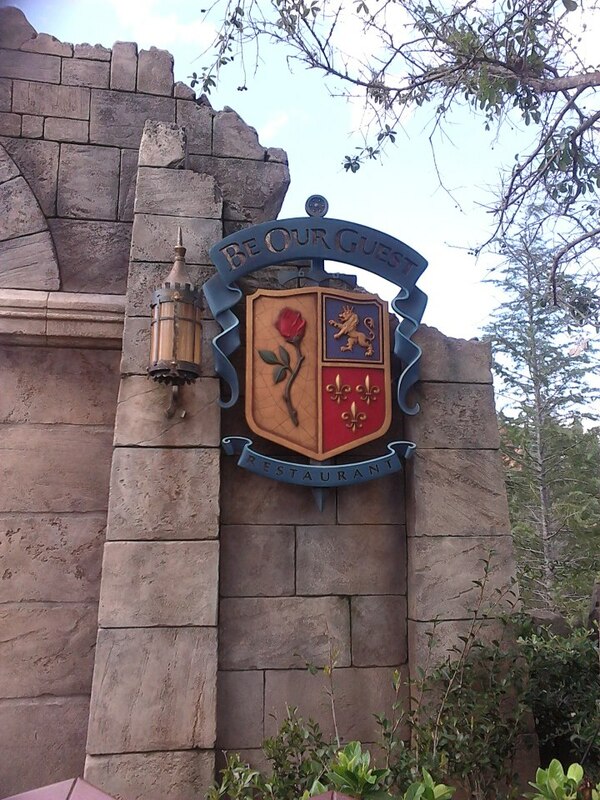 Be Our Guest is elaborately themed around the Beast's Gothic castle from Beauty and the Beast, which is set in France. Awe-inspiring set design brings the rolling hills and steep mountain peaks to life. As you cross the massive stone bridge to the restaurant's looming entrance, you feel as if you are transformed into the landmarks direct from the film. 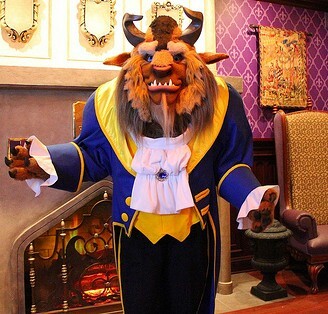 Murals, decorative details and stunning layouts create an inviting dining experience that combine the flair of the Beast's enchanted staff with his rugged, Belle-refined sophistication.The Be Our Guest dining experience is quite unlike the Disney "norm", in more ways than one. 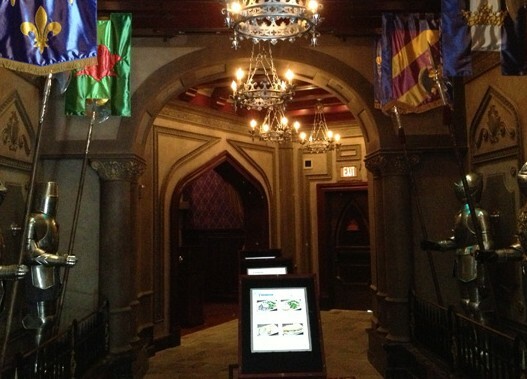 For starters, there are three dining rooms within the restaurant, all depicting scenes from within the Beast's magical castle. Reports on seating selection vary by experience. Some will say you have no choice in which room you are seated, and some of us have had the option to choose a dining room. 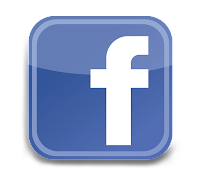 It's safe to assume that this all depends on crowd levels and availability at the time of your visit. I don't feel that any particular room is "better" than another, per se... it would just be a matter of taste. 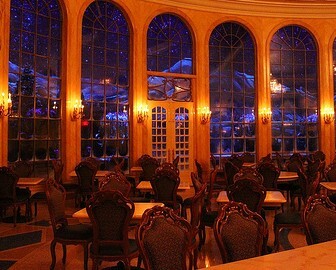 The West Wing - Though once forbidden to Belle, guests can delight in a truly sensory dining experience in the West Wing. Lots of thoughtful little touches to appreciate here. Muted lighting is complimented by the building sounds of rolling thunder. 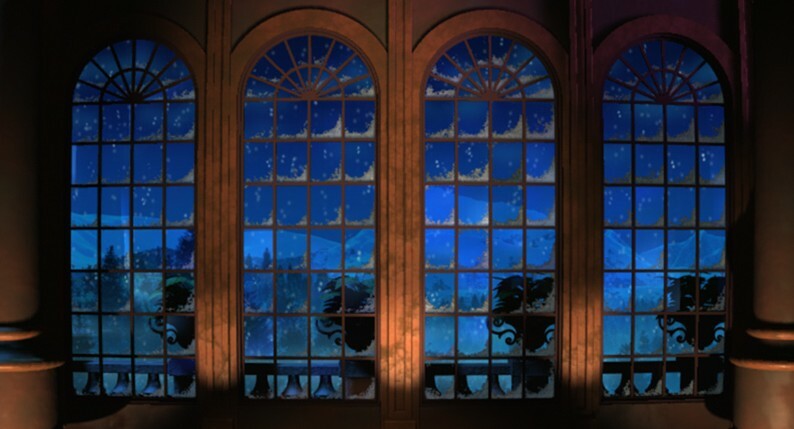 As the storm approaches, take notice of the ominous features throughout the room... they change before your very eyes! The ripped portrait of the Beast's Prince persona slowly morphs into his current beastly image, as petals slowly fall from the ever-important enchanted rose so carefully preserved in this, the Beast's most private of areas. The West Wing is a smaller, cozier room with a bit more space between wood and leather table sets, and muted lighting. The Ballroom - The bulk of the 550-person seating area within Be Our Guest is in the Ballroom. A cherub-covered ceiling is highlighted by extravagant, jeweled chandeliers. Marble tables are flanked with elegantly carved chairs. Best of all - the arched, floor-to-ceiling windows on the far end of the Ballroom provide a remarkable, snowy backdrop over the evening countryside. Be forewarned, there are many tables lining this sprawling, open room. Volume is high, and lighting is low, but it is a charming dining experience. The Rose Gallery - Usually, the Rose Gallery is only open during lunch service. When peak crowds are on-hand, however, it has been known to be open during dinner hours as well. The highlight of the Rose Gallery is the nearly 7ft. 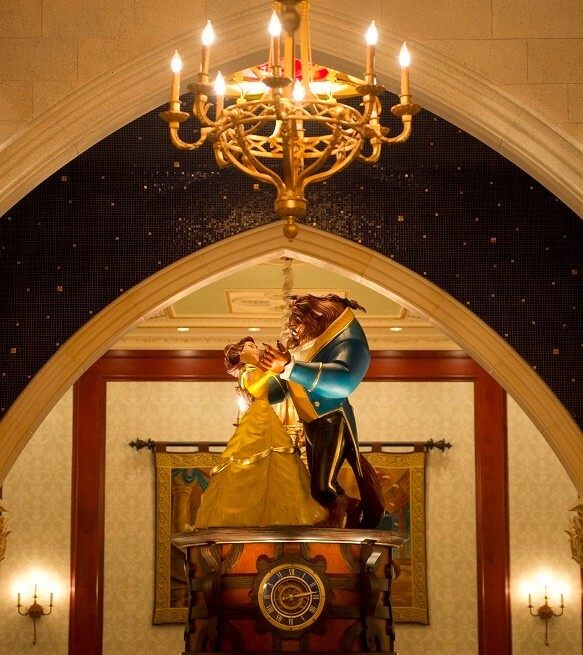 tall, fully-functional centerpiece music box featuring Belle and Beast twirling in their famous ballroom dance. 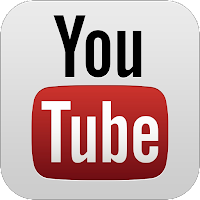 Colorful characters line the walls and jubilant, entrancing tunes merrily set the atmosphere. 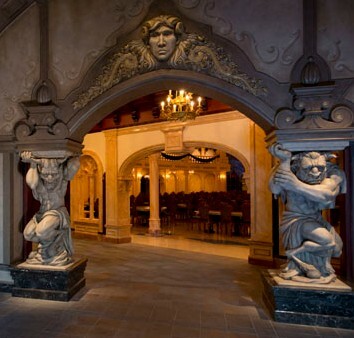 Another unique aspect about dining at Be Our Guest is that lunch and dinner are two entirely different experiences. Lunch service is a more high-tech version of counter service dining. Upon arrival, you make your menu selections via touch screen computer in the Beast's Study. 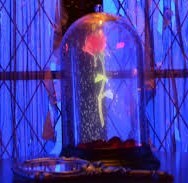 You then receive a "magical rose" as you make your way to your table. 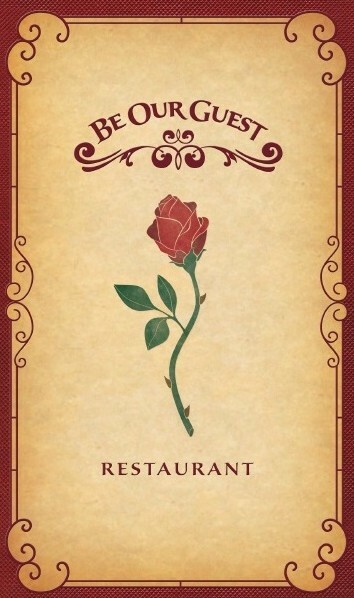 The "rose" is equipped with RFID technology that will help the "Beast's Servants" match your meals with your table when your order is ready. To make sure your dining experience is up to the Beast's strict standards, your meal will be served on real china. Lunch is served from 11:00 am - 2:30 pm. Dinner reveals full-service, extended menus and generally the complete "ooh la la" experience. No magical roses, or touch screens, but you will be graciously catered to by the Beast's fine staff from entry to departure. Prices go up as well, but that should be expected. Keep in mind, evening is when the Beast awakens and begins to roam his castle, so don't be surprised if he appears for a stroll through your dining room. He can also be found greeting guests in his Study. Dinner is served from 4:00 pm - 9:30 pm. Okay, so far I've pointed out a couple of notable touches to the Be Our Guest experience, but let's address the elephant in the room... no, not Dumbo... he's over on the circus side of Fantasyland... I mean, the other elephant... the pink ones! (Alright, already... enough with the Dumbo references!! Sheesh!) 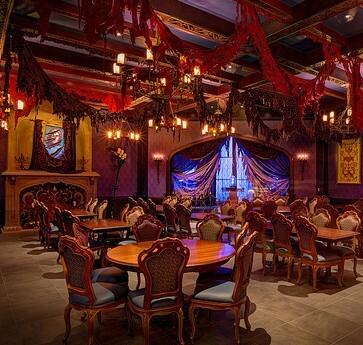 Be Our Guest broke ground by being the first location to offer beer and wine within the Magic Kingdom! I know that some were ready to faint over this shocking event, but to date, I have neither seen nor heard of any stumbling whinos tumbling out of the castle... not even Gaston. 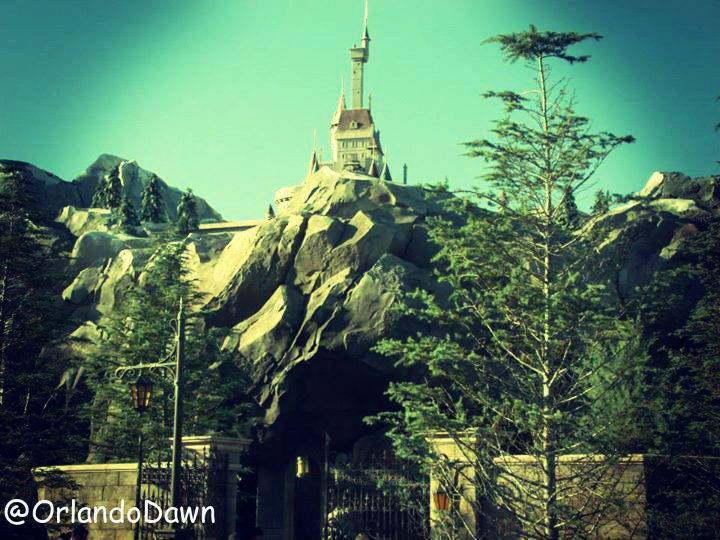 Speaking of Gaston... shouldn't some of that beer make it over to his tavern? LeFou's Brew is cool and all, but.... well, you know. And, finally... the food! OH, THE FOOD! 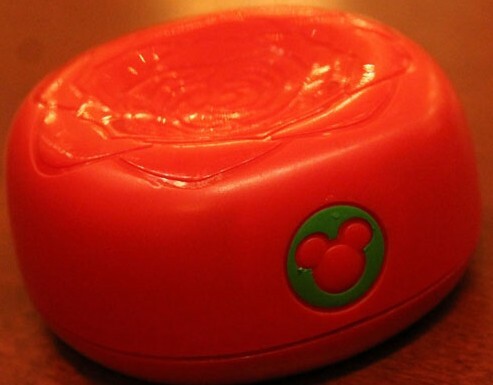 It is pricey, but it is more worth it than most Disney dining experiences. 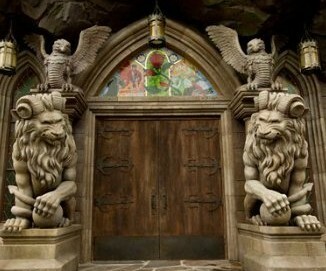 Beyond all the ambiance and exquisite detail to soak up, the food is quite plentiful and above standard Disney quality. Yes, you could still find better overall bang for your buck off property, but you have to expect a hike in the price tag within the gates. Lunch offers soups, salads, sandwiches and the famed Braised Pork. Soups are under $6, salads $10-$15, entrees and sandwiches range from $10-$15. Dessert offerings include a respectable variety of cream puffs, cupcakes and sorbets - each under $5, with gluten-free and sugar-free varieties available. Children have a larger range of options here than at most Disney restaurants - seafood, pork, meatloaf, pasta, sandwiches and chicken - each under $10. Dinner introduces the appetizer menu. Protein lovers will sincerely appreciate the meat and sausage tray for two. Just order it - trust me! Entrees include something for everyone with pork, steak, fish, chicken, shrimp, lamb and even Ratatouille! Prices on the entrees range from around $18-$34. 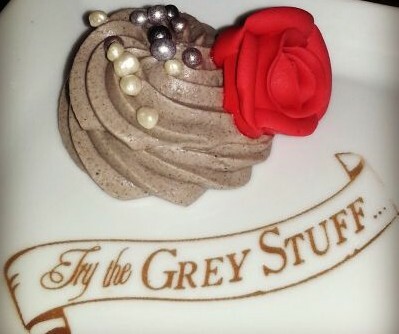 Desserts remain about the same, but with dinner you can also try the grey stuff... it's delicious! All-natural foaming fruit punch and lemonade can be purchased in light-up souvenir goblets for around $17... a wee bit steeper than most souvenir cups, but it is cute. Worth it? 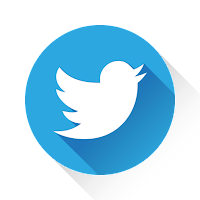 That's up to you. The drinks alone can be purchased for under $5. 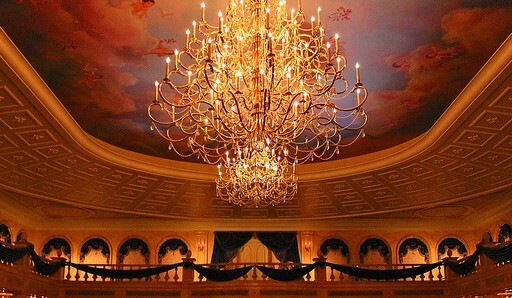 For the full, current Be Our Guest menu, please click here.